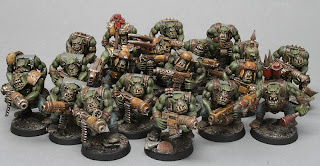 A mob of 12 'ard boyz just about painted before the end of Orktober. I will probably have to re-shoot the pictures as they seem a bit over-exposed. I'm afraid it all turned out to be a bit of a damp squib in the end, this Orktober lark. I have made a start on the warboss, but the trukk remains un-primed. The lure of chaos proved too strong and my mind is back on fantasy for a while. So 40k will be on the back burner for a few weeks, but I'm hoping to get the bug again soon. The rust on the guns and armour is a wash using MIG pigments, heavily diluted with water. I have used an earth colour and standard rust. The yellow paint starts as Coat D'arms leather brown stippled on with an old brush - despite the name this is actually more of a yellow colour. Then a second stippling with some horse roan added, finally scratches picked out quite carefully with boltgun metal. The whole area is then washed with Citadel washes, sepia and mud. Pick out any remaining details that you feel are necessary. The teeth and nails are a good candidate for a quick highlight with horse roan. Similarly, tidy up any areas of fur with a quick highlight with horse roan. 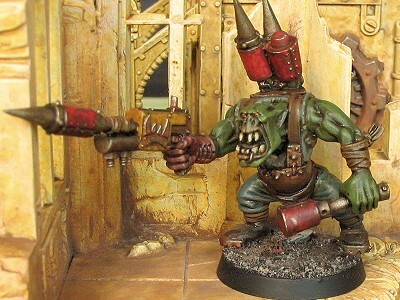 Here's a picture of the shoota mob fully painted. The final section of the painting guide will be posted in the next few days. In the last section I applied the basic colours and a wash, resulting in a useable but murky figure. In this stage I bring back some colour and detail. It's a simple stage, simply highlight any areas that need it! The most obvious area is the skin, so it is highlighted with Coat D'arms (CDA) Olive, with a little yellow added for the final highlight. The lips and nose get a quick highlight with CDA Beige Brown. The clothing is also re-highlighted with the appropriate base colour - tunic with CDA Field Grey, trousers with CDA Green Grey, etc. The straps are also worth touching up in this way. Dot in the eye with a red and yellow highlight and the figure is ready for the final stage. I spent the weekend assembling the ork trukk. It is an amazing model, far more detailed than any other plastic kit I have worked on. It reminded me of the old Airfix kits I used to put together as a youngster, only now I manage to do it without using a whole tube of glue. 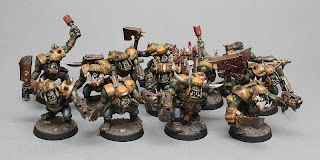 I'm not the first to use the term "Orktober" and I'm sure I won't be the last, but I really want to make a big push this month with them. After a reasonable start, I seem to be struggling to find the time for them recently. I have over 50 assembled, 15 completely painted and the final 5 of the shootas mob partially painted. Once they are finished, I would like to tackle the ard boyz mob and their trukk. That would give me 2 troops selections fully painted. 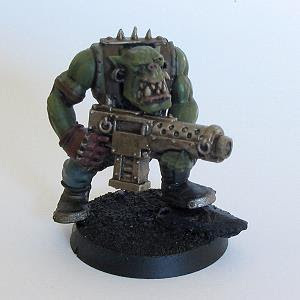 Add to it a HQ in the shape of the Black Reach warboss and that would be a decent start to the army. If I could get more than that in the month I would be very happy. Here's the rokkit launcha conversion from the shoota boyz, though I am starting to think that 2 big shootas would be a better option for this squad, as they tend to take on infantry rather than vehicles. Cracking armour is a problem for the army, so I do need some rokkits somewhere, but maybe a squad of tankbustas is a better place for him.